When one of Santa’s reindeer suddenly announces his retirement, he needs to find a replacement and fast! Against all odds, Elliot and his best friend Hazel set out to prove that he is the horse for the job. As Elliot and Hazel take on the North Pole reindeer try-outs, Hazel learns that Christmas as we know it may be headed for disaster. Meanwhile, back at the farm a potential new owner has plans that threaten the lives of their friends. 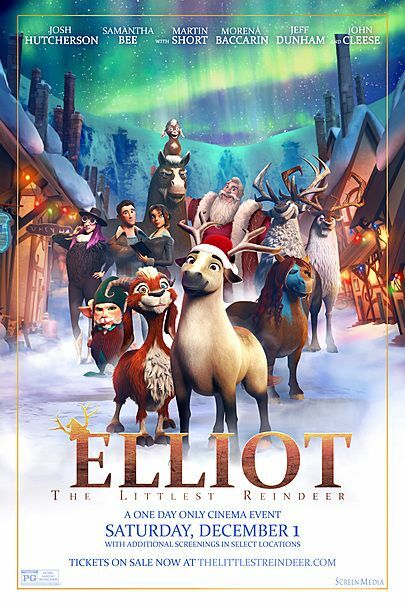 Elliot is faced with the biggest decision of his life: save his friends or follow his dreams and save Christmas. Maybe he doesn’t have to choose; after all, big dreamers dream big! Featuring the all-star voice talent of Josh Hutcherson, Samantha Bee, Martin Short, Morena Baccarin, Jeff Dunham and John Cleese.